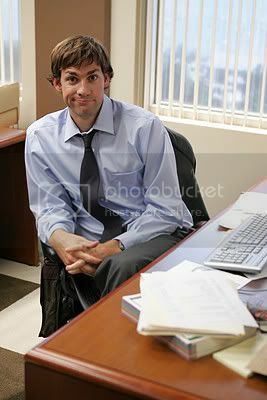 I know he’s a fictional character and blahblahblah, but I am hopelessly in love with Jim Halpert from The Office. He’s hilarious with all his pranks and has that boy-next-door-cute thing going on rather than a hit-you-over-the-head-with-hotness thing which, in my book, is preferable. Do you suppose it’s possible to add a fictional character to “The List”? It’s not like it lessens its realism or anything–the odds of my sleeping with Michael Vartan are probably pretty comparable to those of my sleeping with Jim Halpert. I’ve accepted this. Why are you hating all these smells? You pregnant? good lord no. i’ve always hated the smell of those things. i just felt like making a random list. I also hate the smell of melted butter. And I bet you could make a whole separate list for fictional characters. I’m with you on Darcy. I think I’d include Gambit from the X-Men, but on top of being fictional he’s a drawing, so that throws in a whole new twist. eh, it’s your list. you can do whatever you want with it and we’ll ignore the logistics. who else? Oh Lord, I would so get with Gambit. I was extremely disappointed that he never showed up in any of the films. I guess they already had a brooding “I don’t know if I should really be a good guy” character but, if they introduced Gambit, they could have had a charming one with a sense of humor. Yea, I was disappointed too. True, he is a “newer” character but he’s a pretty popular one too. Banana and butter I agree with, though. In high school chem, we used butyric acid, which smelled like rotten bananas. Still can’t get the feeling out of my body when I think about it. Ergh!!! Gotta go find my leather jacket to counteract…….!!!!!!!! !